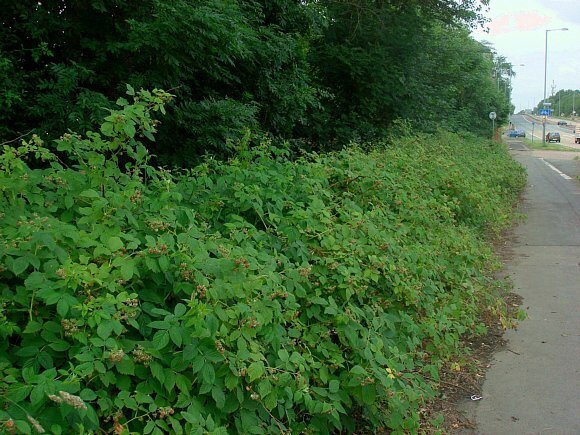 Garden escape spreading beneath deciduous trees beside arterial road. Leaves apple-green, pronouncedly crimped on the veins, with forward-pointing teeth. Stems almost bereft of spines. Flowers just turning to multi-lobed fruits. Fruits red, edible, comprising few spheres (druplets) , unlike Blackberry which have many more druplets. 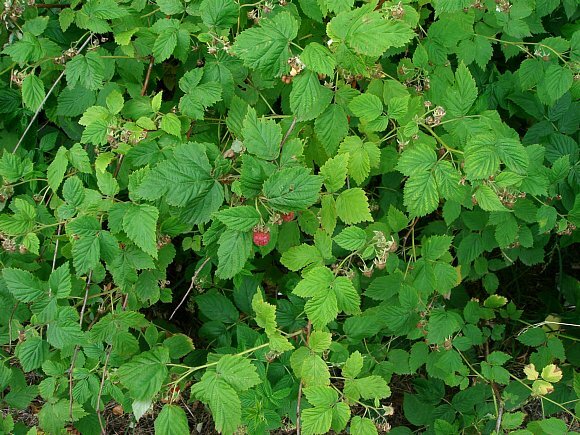 [Blackberry fruits are red at first, but soon turn black]. Five light-coloured backwardly directed isosceles-triangular shaped sepals surrounded by a ring of now brown stamens and anthers. Any spines are weak, and few (top middle). Druplets coated in felt-like short fine hairs. 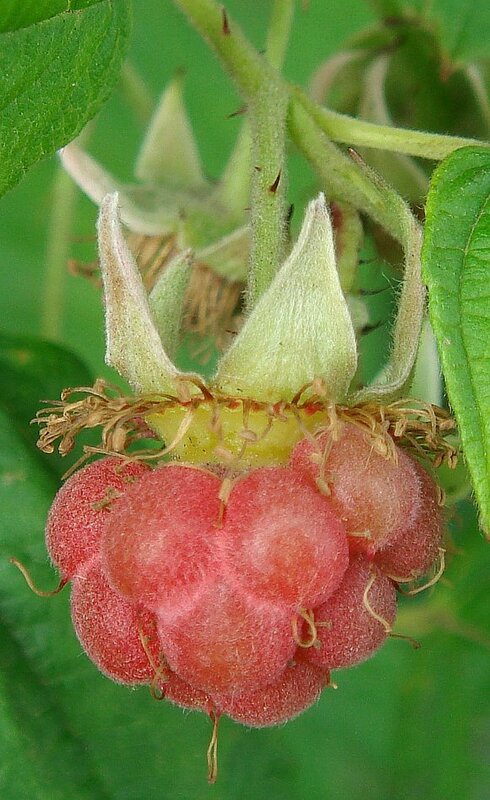 Some similarities to : Loganberry (Rubus loganbaccus) but Loganberry has fruits shaped like prolate spheroids rather than the hemi-spherical of Raspberry. 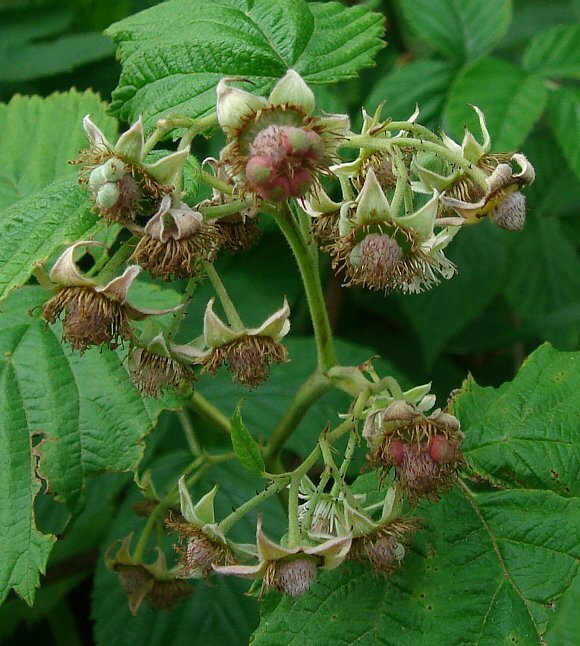 More similar to Wineberry (Rubus phoenicolasius), but Wineberry has pink flowers rather than off-white and much longer sepals. 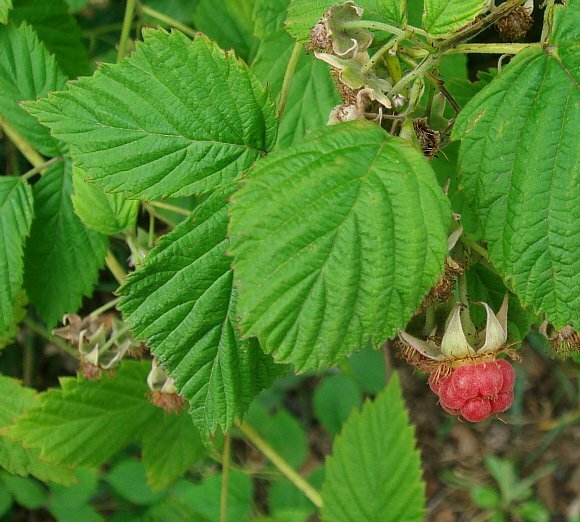 Distinguishing Feature : tastes of Raspberries! Grows in woods, on scrub, on heaths and also as an escapee from allotments and gardens. When ripe, the fruits are easily picked off. The fruit is eminently edible, or even delicious. 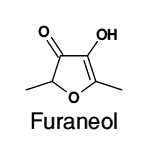 Furaneol (aka Strawberry Furanone Pineapple Ketone or 2,5-dimethyl-4-hydroxy-3(2H)furanone) which is also found in Strawberry fruit and in Pineapple s and many other fruits where it is responsible for their smell. 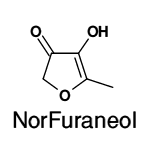 NorFuraneol (aka Toffee Furanol or 5-methyl-4-hydroxy-3(2H)furanone) has a strong sweet odour of caramel and is both toxic and an irritant to the eyes, skin and respiratory system and is used in the food industry as a scent. It is formed in Maillard reactions when sugar is heated or bread is toasted, or when any carbohydrate is heated to high enough temperatures. It contributes to the odour of many fruits, especially to that of Pineapple . 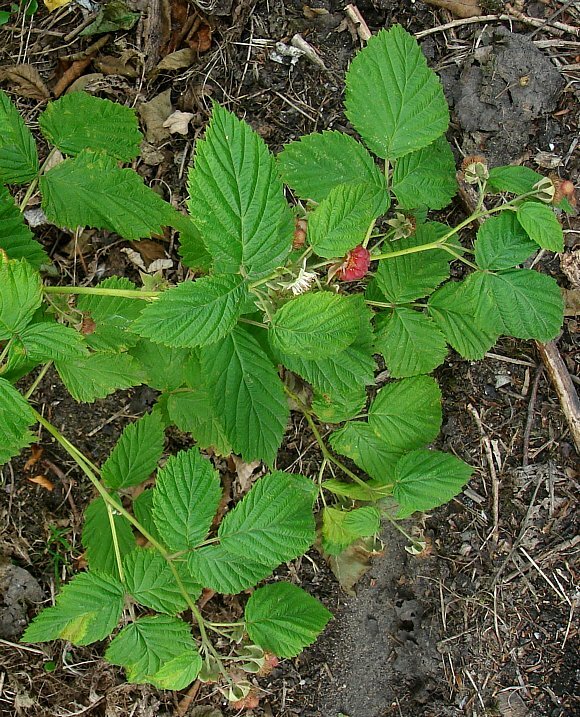 Mesifurane (aka Strawberry Furanone Methyl Ether or 2,5-dimethyl -4-methoxy-3(2H)furanone) is also found in Strawberry , Pineapple , Raspberry , Blackberry , Mango and Cape Gooseberry. Notice that it has one extra carbon atom than does Furanone. 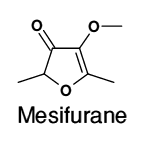 This furan smells not of strawberry, but musty, mildewy or mouldy - perhaps it is a degradation product of Furaneol after fungal threads have started to decay the fruit(?). 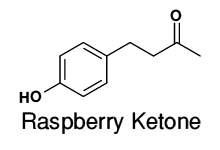 Raspberry Ketone (aka 1-(4-HydroxyPhenyl) -3-Butanone) is a phenolic ketone and characterises the smell of raspberry, working in tandem with the two Ionones below. It has an intense, warm and penetrating character reminiscent of raspberry jam. 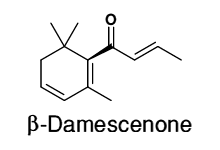 The α-Ionone in within Raspberry is the pure (R)-(+)-(E) enantiomer, so this may be used as the forensic compound for preserves - detection of any other enantiomers signifies the presence of artificial aromas which are manufactured in their racemic form, a mixture of all enantiomers. The fruit itself contains the dimeric ellagitannin Ellagic Acid, which is a dilactone of HexaHydroxyDiphenic Acid. Ellagic Acid is an anti-oxidant. Two other ellagitannins are contained in the fruit, Sanguiin H-6 , which is a dimer of a much larger molecule than is Ellagic Acid, and Lambertianin which is a trimer containing the same monomer. 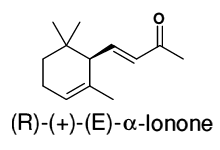 It also contains ethyl 5-hydroxyoctanoate and ethyl 5-hydroxydecanoate, the latter two being unstable. Eleven terpenes have also been found.